An exceptional, beautifully presented, detached house, constructed 2009, occupying a discreet corner position in this sought-after residential cul-de-sac with no passing traffic, enjoying elevated views over the outskirts of the village to surrounding unspoilt countryside, providing faultless and most tastefully presented 4 bedroom, 2 bath/shower room accommodation with integral garage, additional parking and attractively landscaped gardens. Constructed in 2009, 27 Trevonnen Road occupies an extremely good, corner position in this popular residential cul-de-sac, with no passing traffic, and beautiful, far-reaching views from the rear elevation over the edge of the village to surrounding unspoilt countryside. Benefiting from double glazing and gas fired central heating, the owners have created a faultless and most tastefully presented family home, with the accommodation in brief comprising: sheltered entrance, reception hall with turning staircase, ground floor cloakroom/WC, lounge with bay window, interconnecting and extremely versatile dining/sitting room with patio doors onto rear terracing, well equipped kitchen, separate utility room and, from the first floor galleried landing, an extremely well proportioned master bedroom suite, three further double bedrooms, and an attractively appointed family bathroom. In addition to an integral garage, there is parking for two/three vehicles to the front of the property. An extensive decked terrace extends the entire width of the rear of the property, ideal for outside entertaining etc, below which there is a large storage area which offers scope for improvement for use as a workshop etc. The gardens are well enclosed and have been attractively landscaped and planted to the side of the house, where there is a further raised terrace with gateway returning to the front elevation. Trevonnen Road is ideally situated for Ponsanooth's amenities which include a village stores, public house, church, regular bus service and extremely highly regarded county primary school. There are many lovely rural walks in the area, including through nearby Kennall Vale, with the sailing waters of the Fal Estuary readily accessed from nearby Mylor Bridge and Harbour. With the port of Falmouth and cathedral city of Truro five and seven miles distance respectively, Ponsanooth is a perfectly positioned village for all mid, south and west Cornwall's facilities. Inset down-lighters, attractive, easy-rising turning staircase rising to the galleried first floor landing. Radiator with timber screen. Under-stair storage cupboard. Panelled doors to the ground floor rooms, moulded architraves, brushed steel finger plates and sockets. Attractively appointed with a white two-piece Savoy sink comprising a low flush WC and pedestal wash hand basin with tiled splashback. Obscure glazed window to the front elevation. Inset down-lighter, extractor fan, radiator with timber screen. Superbly appointed with a comprehensive range of cream painted Shaker-style units with brushed steel handles. Round-edged worksurfaces with glazed splashbacks and concealed pelmet lighting. Four-ring Candy gas hob with illuminated stainless steel extractor canopy over and oven/grill below. Integrated dishwasher, inset stainless steel sink unit with mixer tap and cutlery drainer. Corner carousel unit. Split level Hotpoint double oven/grill with further storage cupboards above and below. Part barrelled ceiling, inset down-lighters, radiator, space for American-style fridge/freezer. Broad window to the rear elevation enjoying a lovely outlook over the outskirts of the village to unspoilt woodland. Metal up-and-over door, electrical trip switching, light and power connected. Wall mounted Glow Worm gas fired boiler providing domestic hot water and central heating, together with Santon premier unvented hot water cylinder with immersion heater. A patio door has been temporarily fitted, making this an ideal area for use as a studio or workshop if required. Part galleried with elegant turning staircase rising from the reception hall with Velux window providing natural light. Access to loft storage area, panelled timber doors with moulded architraves to the bedrooms. Radiator with timber screen. Central heating thermostat. Fully ceramic tiled walls, white three-piece Savoy suite comprising a low flush WC, pedestal wash hand basin and broad walk-in shower cubicle with mains-powered shower. Obscure glazed window to the front elevation. Inset down-lighters, tall towel rail/radiator, extractor fan, strip light/shaver socket, ceramic tiled flooring. Second measurement into door recess and further, 9'10 (3.00m) broad range of full height built-in cupboards providing further storage space. Window to the front elevation. Radiator. 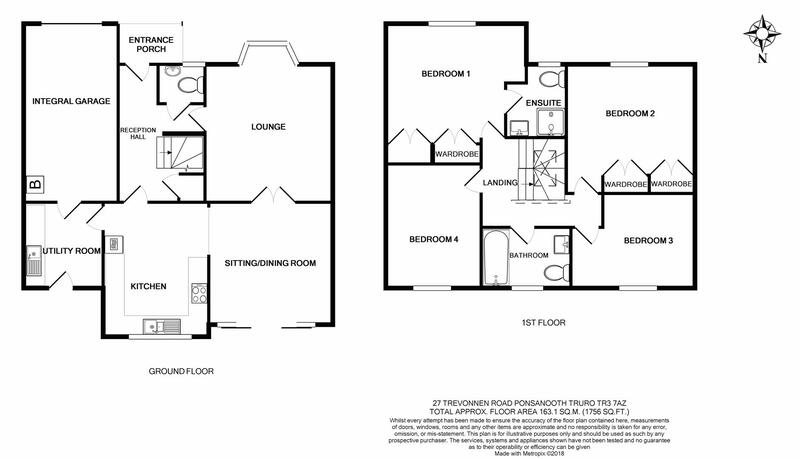 Maximum measurements of another very well proportioned double bedroom. Window to the rear elevation enjoying lovely views over the outskirts of the village to wooded countryside beyond. Radiator. Again, enjoying a lovely outlook from the rear to surrounding countryside. Radiator. Fully ceramic tiled walls and comprising a white three-piece Savoy suite with pedestal wash hand basin, low flush WC and panelled bath with antique-style mixer tap and glazed shower screen. Obscure glazed window to the rear elevation. Extractor fan, inset down-lighters, towel rail/radiator, ceramic tiled flooring. To the front of the property, there is a broad brick pavia hardstanding, sufficient for two/three vehicles, in addition to the integral garage. Gravelled and paved for ease of maintenance, providing easy access to the front entrance door and through a timber gateway to the gardens. Extending the full breadth of the rear of the property with additional pedestrian gateway providing direct access to the parking area. Courtesy door to the utility room, exterior water tap and sliding doors to the accommodation. A lovely, elevated, sheltered sitting-out area enjoying the attractive outlook over the outskirts of the village to surrounding countryside. Located to the western side of the property and therefore enjoying a high degree of afternoon and evening sunshine. Steps from the rear terrace and from a further raised, decked side terrace with gateway returning to the front of the house. Well enclosed to all sides by block walling and timber fencing, attractively planted with many specimen plants including pittosporum, cherry trees, fruit trees and magnolia etc. Beneath the rear terrace there is an extensive covered store which, we understand, could be easily enclosed for use as a workshop or similar. From Treluswell Roundabout, take the A393 signposted to Ponsanooth (1 miles). Proceed into the village, passing the Stag Hunt Inn on the left-hand side, approximately 300 yards after which turn left onto Park Road, immediately adjacent to the village stores. Continue along Park Road, around the left-hand bend, and the entrance to Trevonnen Road will be found after a short distance on the left-hand side, immediately opposite Kennall Vale School.